If you wanted to be optimistic about this, you could say that this represents a sort of opportunity. In sharp contrast to, say, France’s health-care sector, our health-care sector is dramatically, joyously, wildly inefficient. We pay so much more than anyone else and get so much less that it’s easy to imagine a world in which we have a drastically different health-care system that’s both better than the one we have now and that’s wiped out our deficit. 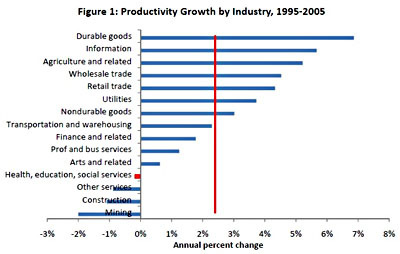 Cutler’s paper explains why productivity and productivity growth are low in health care and what can be done about it. He hypothesizes why we see so little innovation in health care and suggests ways to promote it. It’s a familiar set of problems (asymmetric information, inability of plans and providers to capture long-term returns on short-term investments, plan turnover, third-party payment, etc.) and solutions (bundling, provider integration, pay-for-performance, etc.). So: we need to figure out how to make healthcare more productive. “But we don’t know for sure how best to foster it,” says Frakt. “So, we first need innovation in health policy.” Indeed. But go ahead and read this op-ed too for the other side of the story. Doctors need to change the way they do business, but we patients really need to change the way we do business too.